World Champion Dan Greaves (coach: Jim Edwards) exceeded his own F44 discus World Record and surpassed 59m for the first time with an outstanding mark of 59.27m to take the BT Paralympic World Cup title – one of three gold medals for the Aviva Great Britain and Northern Ireland team across the day – in Manchester this afternoon. Greaves, with a previous best of 58.98 recorded at the IPC Athletics World Championships in New Zealand in January, overcame cold and gusty conditions at Sport City to win gold by over five metres from Jeremy Campbell (USA) with 53.42m. Double IWAS World Junior Champion Aled Davies (coach: Anthony Hughes) led the charge in the F42 category when finishing third overall with a World Leading distance and lifetime best of 44.77m. Katrina Hart (coach: Rob Ellchuk) and Ola Abidogun (coach: Steve Thomas) both scored medal doubles for the Aviva GB & NI team with gold in the T36/37 100m and T46 200m respectively. Hart, IPC World Champion over 200m, clocked 14.43 (-0.4m/s) for victory in the short sprint with team mates Jenny McLoughlin (coach: Darrell Maynard) and Hazel Robson (coach: Janice Coffman) finishing third (14.66) and fifth (15.30) respectively, but, in a close finish, she had to settle for second in the 200m (30.20/+0.1m/s) behind Russian’s Elena Ivanova (30.15). McLoughlin took her second bronze of the day in the 200m with 30.72, with Robson finishing seventh (32.04). Double IWAS World Junior Champion Abidogun made a successful transition to senior competition with a lifetime best for victory in the 200m (23.04/-1.3m/s), going on to take silver in the 100m by only one-hundredth of a second with 11.37 (+0.1m/s) behind Russia’s Yury Nosulenko (11.36). “It was perfect today, I felt good going out for the 100m and the atmosphere was electric,” said the Bolton athlete who was competing in his first senior international event. 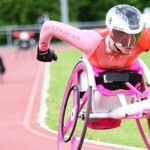 “I’ve been running more often and also racing in more non-disabled events which has been good for developing my speed against good quality competition. 15-year-old Kyle Powell (coach: Paul Macgregor), competing in the same two events as a T45 athlete, marked his Aviva GB & NI debut with two seventh place finishes, clocking 12.32 and 24.64 in the 100m and 200m respectively. Libby Clegg (coach: Tom Crick) clocked a brilliant 26.18 (+0.2m/s) to finish second in the combined class T11/12 200m, just two-one-hundredths of a second outside her three year old lifetime best. The race was won by four-time World Champion and multiple World Record holder Terezinha Guilhermina of Brazil (25.12) who went on to take the double with 100m victory in 12.27 (-0.3m/s), where Clegg finished third (12.87). Also on the track, World Championships 200m bronze medallist Sally Brown (coach: Philip Tweedy), the World Junior champion over the distance, took Paralympic World Cup silver in a windy 26.1 (+4.1m/s) and was only marginally outside her 100m lifetime best when finishing third in the short sprint in (13.16/0.0m/s). On the in field, Kieran Tscherniawsky (coach: Jim Edwards), also an IWAS World Junior champion, was second in the men’s combined class F33/34/57 discus with a new PB of 28.13m ahead of experienced team mate and four-time Paralympian Chris Martin (coach: Phil Peat) in third (27.39m) and World F57 javelin champion Nathan Stephens (coach: Anthony Hughes) in sixth (40.20m). Sophie Hancock (coach: Shelley Holroyd) took bronze in the women’s F40 shot putt with a mark of 7.51m, while Holly Neill (coach: Andrew Roda) and Vicky Silk (coach: Anthony Hughes) finished third (7.09m) and sixth (6.04m) respectively. The event was won by Tunisia’s Tlili Raoua in a new World Record distance of 9.73m. Back on the track, local star Ian Jones (coach: John Dunne) finished second behind Paralympic champion Oscar Pistorius in the combined class T42/44 400m (51.86) – a race in which T42 World 200m champion Richard Whitehead (coach: Liz Yelling) finished fourth (57.06) – and finished fourth in the T44 100m (11.82/-0.2m/s). T36 World 400m Champion Paul Blake (coach: Rob Ellchuk) was fifth in the men’s T36/37 800m (2:12.74) with T37 team mate Dean Miller (coach: Bud Baldaro) sixth in 2:12.92. Ireland’s T37 middle distance specialist Michael McKillop, the double World Champion and double World Record holder over 800m and 1500m and unbeaten since 2006, took the overall victory in 2:02.97. James Ball (coach: Jane Coia) finished fourth in the men’s T12/13 combined class 100m in 11.92 (+0.2m/s) and in the men’s T36/37 100m double Paralympic champion Fanie Van der Merwe of South Africa won gold in 11.80 (+0.5m/s) with Aviva GB & NI duo Ben Rushgrove (coach: Rob Ellchuk) and Graeme Ballard (coach: Steve Thomas) finishing fifth (12.66) and sixth (12.75) respectively. The pair went on replicate that finish in the 200m, Rushgrove clocking 25.79 (-2.1m/s) for fifth and Ballard sixth in 25.86. 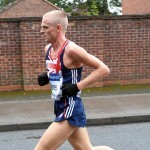 Peter Eriksson, UKA’s Head Coach for Paralympics, said: “We’ve shown once again that we’re on the right path to success in 2012. The senior athletes like Dan Greaves with his World Record have re-affirmed their position as the best in the world and the young ones who did well at the IWAS Juniors have performed brilliantly at senior level.